The European Institute for Climate and Energy (EIKE) here presents two charts which I’m featuring today. They show that the winter temperature trend for Germany over the past 32 years is not cooperating with “experts'” forecasts of rapid warming and snow and ice becoming a thing of the past. 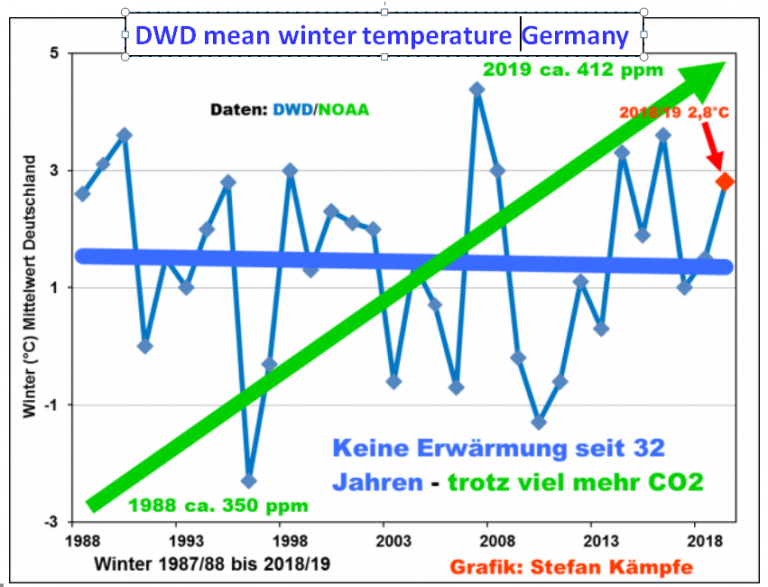 The green trendline shows that although CO2 in the atmosphere globally has increased from about 350 ppm since 1988 to about 412 ppm currently, Germany’s mean winter temperature has fallen a bit. 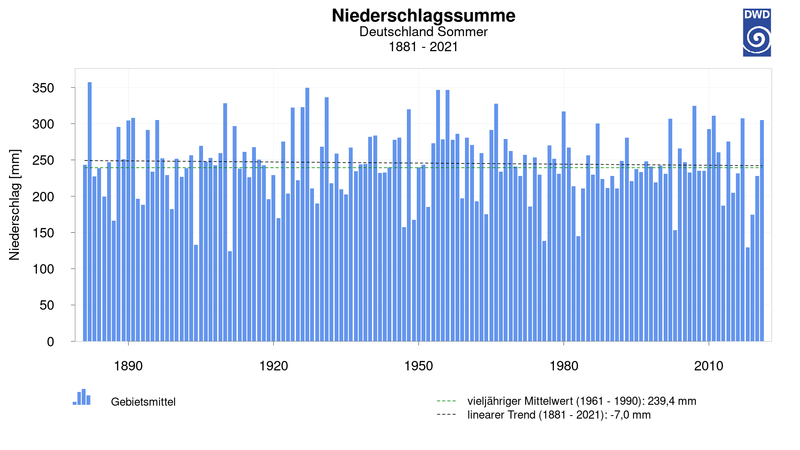 Also the German media are often filled with scare stories telling us we will be seeing increasing number of droughts and dryness, and that last year’s dry summer was just a taste of what is to come. Yet once again the data contradict all the doomsday drought reports. The long term winter precipitation trend since records began has been upward. 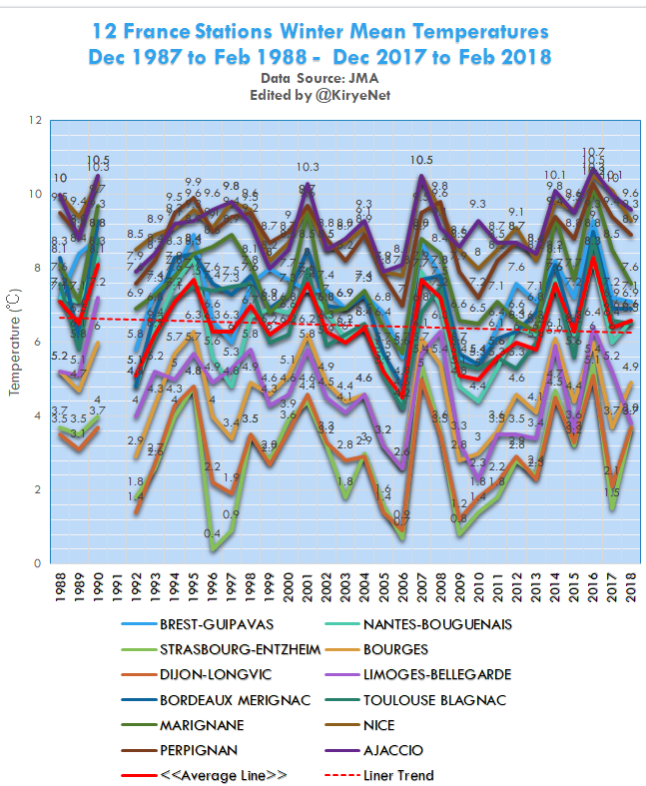 However, we acknowledge the trend has been decreasing (to normal levels) since about 2000. 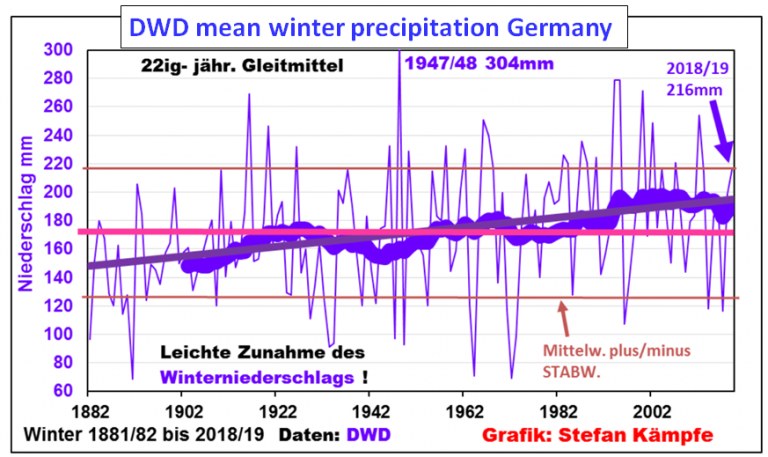 Interestingly German precipitation shows a 40 year cycle, and so likely has nothing to do with CO2. Figure A. 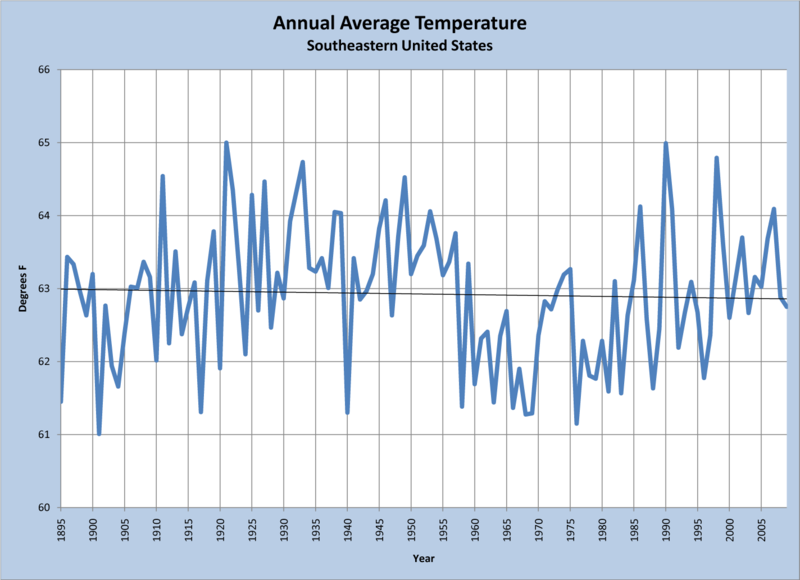 Annual average temperature of the southeast United States for the period 1895-2009. 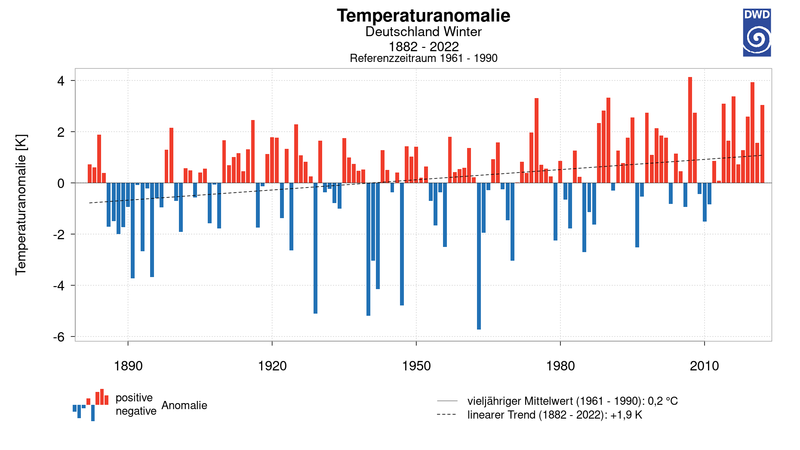 The trendline shows a decrease in average temperature. Bohr, Gregory S., “Trends in extreme daily temperature events in the south-central United States” (2005). LSU Doctoral Dissertations. 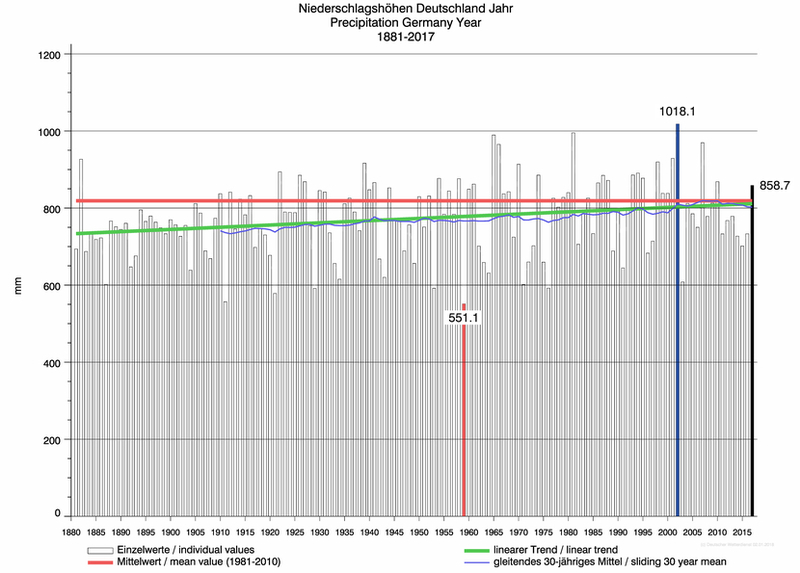 2) trying to correlate temperatures of a small region (here Germany) with the CO2 concentration is a bit misleading, don’t you think? Heat content and changes there of aren’t distributed equally on this planet. 4) again, looking at one region isn’t helpful when trying to determine the effects of CO2 or any connection to a CO2 increase. Heat distribution patterns can change as well and have usually a stronger effect on local climate. That’s also why we have difficulties attributing regional climate change to anthropogenic origins. It’s no problem on the global level, because internal heat distribution has no influence at that level. PROOF energiewende is working:-} Oh wait. Since 2009, while energiewende has generated more & more electricity, temperature has trended UPWARDS in Germany, France and elsewhere. Back to the drawing boards, greenies.